The 2019 Hyundai Tucson is a compact SUV packed with remarkable features. Whether you’re seeking a family vehicle or an accommodating SUV for just yourself, the Tucson offers versatility and function for all lifestyles. Learn more about the 2019 Hyundai Tucson by reading on. New for the Hyundai Tucson for 2019 is a redesigned exterior. The newest version of this compact SUV features smaller, sleeker headlights, a larger, bolder grille, and more chrome trim for a sophisticated and luxurious feel. Under the hood of the 2019 Hyundai Tucson is either a 2.0-liter engine, or a 2.4-liter engine. The standard engine, the 2.0-liter choice, is a four-cylinder engines that earns up to 164 horsepower. The optional engine choice, the 2.4-liter engine, is also a four-cylinder engine, but earns up to 181 horsepower. Both available engines are mated to a six-speed automatic transmission. Step into the cabin of the 2019 Hyundai Tucson and find modern technology features that increase convenience and ease of use. On the dashboard of the vehicle is a 7-inch touchscreen, which comes standard with Android Auto and Apple CarPlay connectivity. Sync your smartphone to the Tucson for music streaming, hands-free phone calls, navigation features, and so much more. Safety is a top priority at Hyundai, which is why the 2019 Tucson comes with several standard safety technology features. These features include lane keep assist, automatic emergency braking, and forward collision warning. Enjoy peace of mind and an extra set of eyes with these innovative safety technology features. 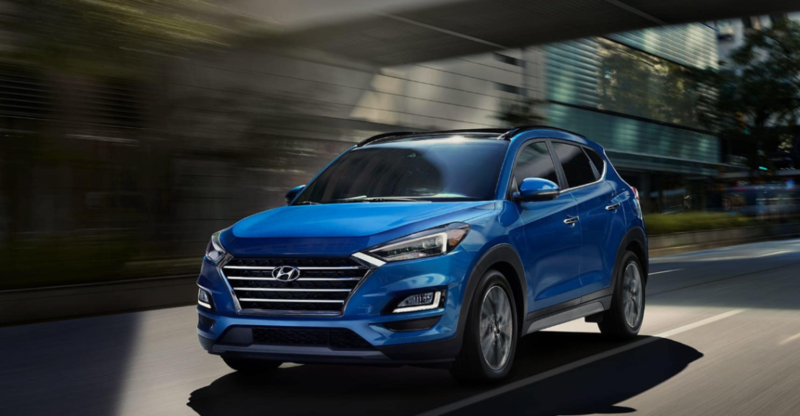 To become the proud owner of a 2019 Hyundai Tucson, make your way to New York Autobrokers. You can find us in New York City, New York, or you can call us at 631-446-4455 to learn more about our inventory. We hope to work with you soon!